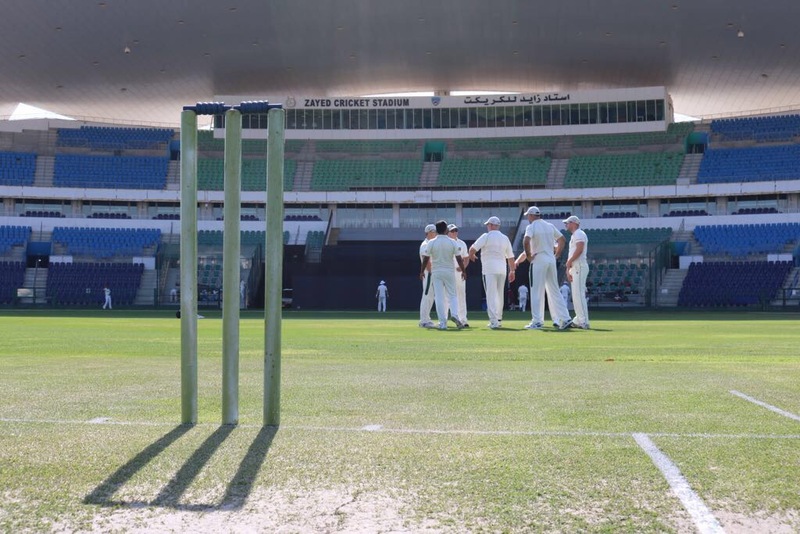 The venue was the illustrious Sheikh Zayed Stadium, ordinarily a batting road for test match players, but the groundsman had seen fit to prepare a green top for the two English teams facing off, and a slightly longer format of 25 overs. George Hellyeah was skipper and immediately told everyone it was his first match skippering, but after that, picked up his team speech and ended strongly. The general plan was to set an off side field and bowl outside off stump. The Abu Dhabi openers were quite contrasting styles. Garth was a trying to nudge it around and the other chap, “Dasher” was swinging from the hip at everything. Matt Jacob was expensive for his first two overs whilst Shehan exerted lots of control. That being said by over 4 we had managed to work out Dashers penchant for the lofted drive, set the long on fielder accordingly, and he duly delivered it straight to the fielder. At the other end, Mike Phillips was brought on for Shehan. It was quickly apparent he was struggling for control as he consistently tossed 2-3 down the leg side every over. A quick word about bowling cross-seam fixed it for him, and he found more consistency. Couple of the shorter balls troubled the batsman, but Nav (the batsman) changed tack and played a variety of late cuts, together with the occasional drive. Mike finished with figures of 4 over for 39 but definitely learnt from his spell against a couple of quality middle order batsman. The halfway drinks were had, and it was definitely even-stevens between the teams. Badge was brought on, but the batsmen were well set and played him comfortably, with the second over going for 13, Skip swapped him for Matt Peet, who despite being hit for a six 2nd ball, then snared the wicket of Nick Gray, at long on, with a fine catch by Brendan. However Matt’s 2nd over was awful, with Nav taking a distinct liking to the filth and taking him for 16 runs, finishing with the reverse sweep over the top of short-third-man. At the other end, replacing Mike Phillips, Jerome came on and bowled well, but was unfortunate not to take the wicket of Shiraz with a bad drop by Matt Peet at Cow Corner. The skipper made a strong call and brought back Matt Jacob back to replace Mat Peet, for his second spell. MattyJ delivered excellent results, with a wicket each over. This was aided by the catch of the match, by Brendan at wide long on, running a good 10 metres, round to straight long on and taking the catch on the run, without stepping over the boundary. I think this was the big wicket of Nav, who finished with a well earnt 60 odd. From here, Darjeeling were able to put the breaks on Abu Dhabi Gents inning. With Sheehan and Krishna finishing their spells. Shehan recorded fine figures of 1 for 29 off his 5 overs and Krishna, the pick of the bowlers, at 1 for 23. The Gents finished with 206 and the general Darjeeling impression was positive that we were going to get these runs. Nav opened the bowling for the Gents and despite Matt Peet warning the team that he was a good bowler, the gallery was not impressed by the pace. 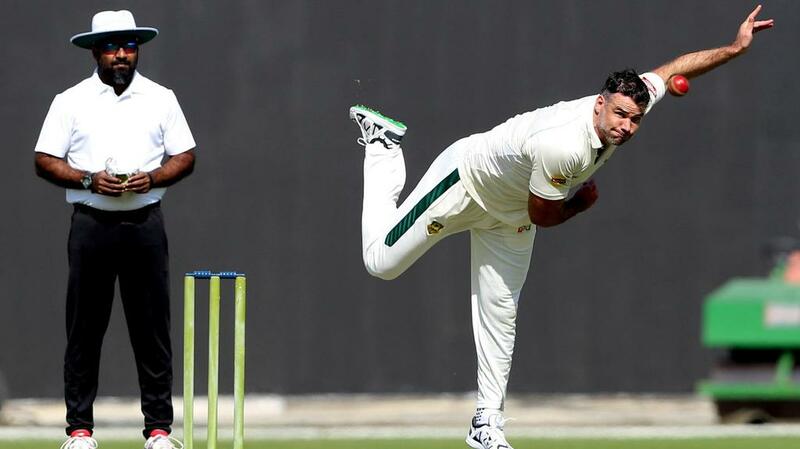 However Sam Jackson recognized the control that Nav bowled with, commenting that he bowled the first over of full away swing, followed by the 2nd and 3rd over, as back of a length seaming inwards, towards top of leg stump. George eventually succumbed to a quality yorker by Nav, losing his middle pole. Jerome came in and looked assured, dishing up regular boundaries. Sam then joined him successfully against the 1st change bowlers, but then got carried away after just missing out on 1 four with a lofted on drive, he swung harder at a low full toss and missed it, losing his middle pole as well. This brought in Shehan to join Jerome. The Sri Lankan pairing looked comfortable, and took us to the halfway mark, just a bit behind the rate at 78 off 13 overs. That being said, the batsman were well set and the gallery was confident, that with wickets in hand, we could find the next gear. However the Gents upped their game, with their bowlers delivering a pinch spell from over 13-17 that saw just 25 runs added. Shehan got out trying to find a boundary, bringing in Brendan WJ. He looked very comfortable at the crease, and after setting himself, he set to the task of boundaries required, scoring a fluent 49 off 30 balls. With a couple of notably strong heaves to cover corner that comfortably cleared the boundary despite a field set for just such a shot. However once Brendan got out the wheels came off the bus. James slapped his wide half volley straight to wide long off. A bit of wind behind it and might have carried over the boundary as it went really high. Matt Jacob was then clean bowled first ball. Krishan survived the hat-trick, but by only 2 balls before he was bowled, with Matt Peet then going back to his first ball and missing it entirely. Jerome then joined the procession, however he had made a very respectable 53 off 49 balls and anchored the innings. But that meant the stage was now set for just playing for a bit of pride not to get bowled out. Badger duly delivered as 11 man, not just surviving but swatting a boundary for a strike rate of 200 off his 2 balls, to pick up the spirits of the players. Darjeeling ended on 165 but he match had been an even contest until deep into the 2nd half. The Gents had bowled well, with just 9 extras in their 25 overs, and their 1 standout player, Nav, pushing the match in their favour. There was no man of the match declared for Darjeeling, as there had been good performance by several players on the team: Shehan and Krishan bowling exceptionally well, Brendan WJ for some excellent fielding including 2 catches. Matt Jacob for finishing strongly at the death with the ball. Then Jerome and Brendan WJ both making good runs. Overall we have something to build on for 2018, the match was played in excellent spirit by both teams, the weather was excellent and refreshing beverages were had after the match. P.S. if you are playing the next match in Abu Dhabi, pack your cooler bag. This entry was posted in Club News, Cricket, Match Report and tagged 2018, Abu Dhabi, Amateur Cricket, Cricket in the Middle East, Cricket in the United Arab Emirates, Friendly, January, News, Sport, Zayed Stadium. Bookmark the permalink.